Well the great news is that the project is now 101% funded. There are still a few days left, but I have hit the total and can plan my trip to the Tyrrell for April! Obviously the best news if for regular readers and friends as it means in the short term at least I’m going to shut up and stop hassling people to fund me or tweet about it. Still, if you do want to push a few bucks my way, don’t let me stop you. Excess funding (i.e. over and above the 100% target) will help cover costs of OA publication so it’s not a waste or going to my pocket. Project T-shirts and other goodies are still available and of course if you contribute you’ll be in for the draw to win the lovely Luis Rey artwork. On the subject of art, I was alerted to this yesterday. It’s by Finn artist Tuomas Koviurinne (you can see more of his stuff here) and he did it to support the project and was good enough to let me post it here. It’s gorgeous, obviously, and much appreciated and inspiring to see this is already making people think and produce things this cool. Wow. I want to add a massive and final thanks to all those who have helped to date in various ways. Darren Tanke for inviting me to do the work, Don Henderson who’ll be hosting my trip, Denny Luan and Microrzya for hosting the appeal, David Orr for his awesome project design and running the shop, Matt van Rooijen for helping with the video, Brett Booth for his auctioning off of his wonderful art, Luis Rey for the cool picture he created and donated and Julius Csotonyi for putting his stuff forwards to help out as well. Thanks of course to all those who have tweeted, blogged and Facebooked this and helped keep things moving and advertised the project. And yes, of course, a massive thank you to all those who have generously donated funds to the project. It is very much appreciated, and I hope I can repay your faith with some cool research. Elaphrosaurus last got a mention here way back in 2009 when Limusaurus came out. 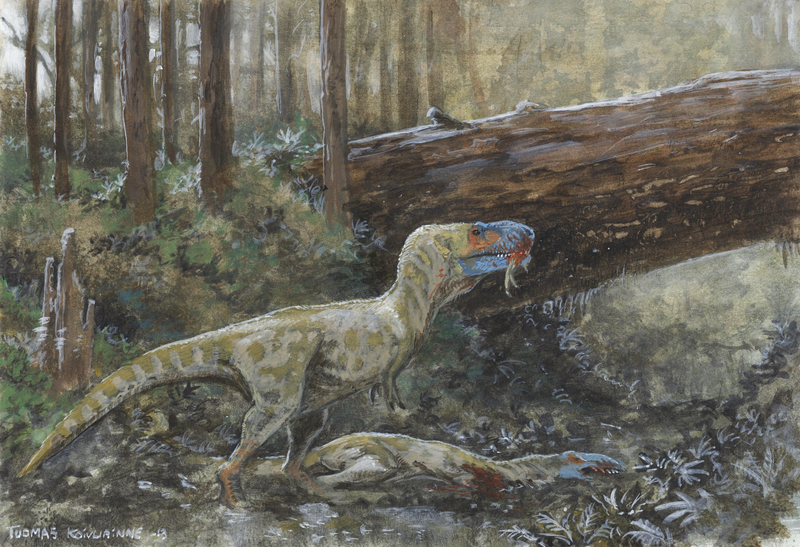 In the phylogeny accompanying that paper, the two were recovered as sister taxa which hinted at the possibility that Elaphrosaurus was also herbivorous. Given that there’s no known skull, that’s not as outrageous as it sounds alongside this image – the head was reconstructed before Limusaurus was known. Whichever way it cuts though, this is a great specimen in great condition and a lovely mount that shows off the material. You can also spot a really quite hefty theropod femur in the case behind it as well – this might be the only vaguely-complete theropod from Tendaguru, but it’s far from the only theropod known. Keeping on track with clearing out the Berlin backlog, here’s a couple more beasties from the main gallery (though obviously rather smaller than the sauropods!). Above is the lovely stegosaur Kentrosaurus which is remarkably complete and with a lovely long tail (for those keeping track). 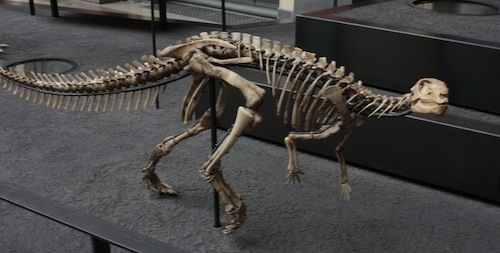 The stegosaurus don’t seem to get too much love, but they’re fascinating animals and despite their obvious affinities to the other thyrephoreans, have a unique bauplan with those stumpy little forelimbs, humped backs, and all those plates and spikes. Below is the the little ornithopod Dysolotosaurus. Again, something that’s rather underappreciated (how many drawings of tyrannosaurs online are there vs the small ornithopods?) and yet this is one of the species of dinosaur for which we have the most fossil material. Thousands of elements were collected in Tendaguru and shipped back to Berlin and from there, many were set out to other collections in Germany given the profusion of material. Sadly as with many other collections, a fair amount of material was lost to second World War bombings, but even so, a very large amount of material remains so it’s something that deserves more research attention that the relatively little it’s had to date. 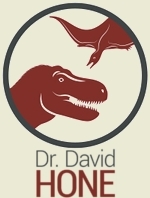 I’m badly behind on the blogging here and especially covering my January trip to Berlin owing to a combination of illness, work and the Daspletosaurus project (only 3 weeks left!). 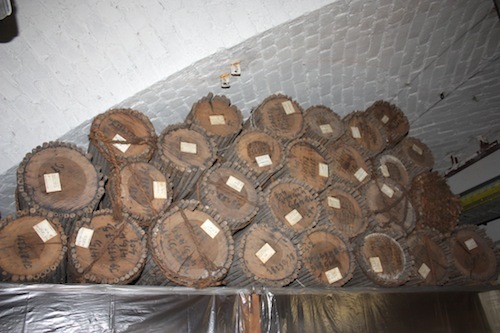 Still, while there’s much more to come, I’ll grab a few minutes and post a little about the big bone store in the basement in Berlin featuring these wonderful containers (if you don’t know what they are, feel free to guess, answer at the bottom below the fold).